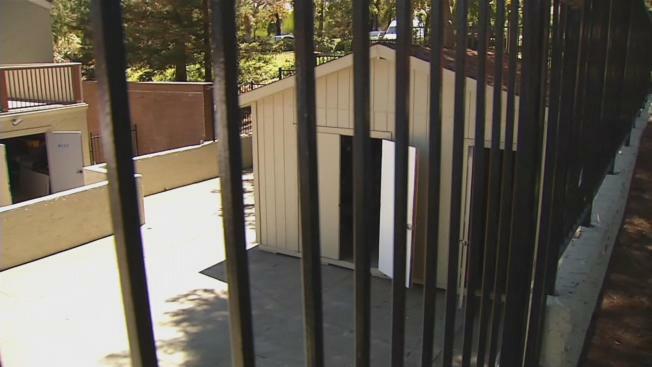 Police say a man followed a teenage girl into this pool shed before inappropriately touching her (August 2, 2016). Police and residents in the East Bay are on the hunt for a man suspected of inappropriately touching a teenage girl at a pool in Concord. A 16-year-old lifeguard working at the Walnut Country Crossings Clubhouse pool made her way into a supply shed Sunday evening when a man entered the small storage facility, sat down and touched the girl's thigh. He then latched onto the edge of her shorts and yanked them up toward her waist before fleeing the scene, police said. Residents and pool-goers were stunned to hear the news. "Broad daylight, that surprised me," said Traci Cannon. Homeowner President Mark Weinmann says that the man somehow gained entry into one of the gates and staked out the premises before making his move. According to a police description, the suspect is described as being a thin man in his 40s. Further details indicates that the suspect is roughly 5-feet, 6-inches tall and has short brown hair. The suspect was sporting a gray and orange t-shirt and blue jeans when he fled the pool deck. The homeowners association is adding additional lifeguards to make sure that no individuals are alone at any time and will continue to comb through surveillance footage.